Bri Ribaj: Ohio State Buckeyes: Go Bucks! Ohio State Buckeyes: Go Bucks! It is nigh impossible not to be a Buckeye fan in Ohio. People live and breathe for the Buckeyes. And it's like nothing else I have ever seen. HBO is about to broadcast a documentary on the biggest football rivalry of all time: Ohio State vs Michigan. One needs to see it to believe it, for it may, indeed, remind one of the zeal of a medieval battle. And most of the people here do regard football with the utmost respect and attention. The place where the magic takes place is that elusive heterotopia called the stadium. It's a place where like-minded, red-wearing people get to bond, discuss the game, and befriend each other. It's beautiful, really. I met lovely people, ate nachos with artery-clogging cheese and an uber-salted pretzel, and found myself screaming: Defense, Go Bucks, Touchdown, Boooo! 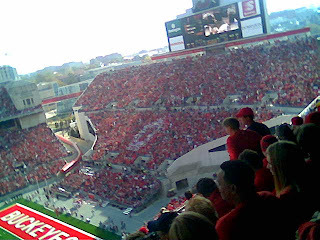 There is something irrevocably appealing about being in the company of over one hundred thousand red-wearing, Go-Bucks-chanting people. It's a feeling that is rendered concrete only when in such a setting. We played Wisconsin today and, naturally, we won. Again. Thus keeping our record intact. The Bucks perform with an infallible precision and they get strategy. How can they lose, really! So, today I write as a Buckeye fan. Excellence, after all, demands attention and respect. Whether in scholarship, the arts, soccer, or even football. Yes, and let me not forget that very novel experience of nacho-eating. What an inspiring heterotopia the stadium is! ok, first, dude, nachos? Bri eating nachos? as you put it, it would be a text. i second your enthusiasm with another GO BUCKS! when is that HBO special? Pretzels, nachos, and touchdowns. Indeed. It is amazing how precize they are on the field. Anybody with athletic instinct is bound to react. And I do remain a loyal soccer-ite, of course. After all, one does not preclude the other. They do rock, though. Awesome team. And sorry the Bucks lost yesterday to Illinois. You were in the stadium and you saw a little boy cry due to the loss. That must have been sad. No, not being obnoxious. Wouldn't dare to joke about such things.